I came across the Neon Chandelier by Matt Diller three years ago in the debut issue of The New York Times' T Magazine. 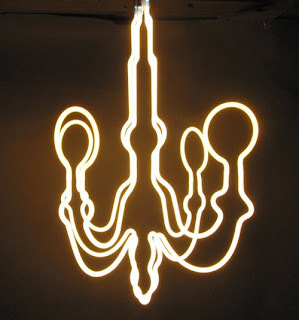 I love the idea of reinterpreting an icon, and rendering a classic chandelier in neon does that to terrific effect. It's beautiful, modern and whimsical. That's a killer combination in my book. I've seen this thing in person a couple of times and man, it can stop traffic. Then again, I've never seen it anywhere but on the Isle of Manhattan. I can only imagine that its effect would be magnified tenfold out here in the hinterlands. 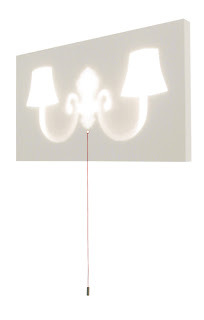 I was on Dwell's website this morning and Jasper van Grootel's Voltaire sconce is their hot product of the day. Dwell's website is a great resource for where to go to get modern stuff for your home. The Voltaire is available, as are all of these lights I'm posting today, through a website called Generate. Van Grootel's "Fantastic Plastic" series takes every day objects and puts an interesting spin on them. 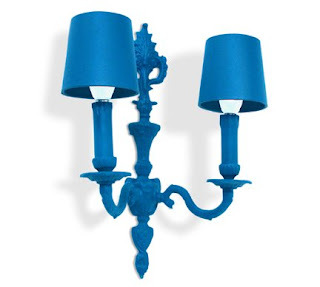 In the case of the Voltaire sconce, he takes a vintage wall sconce, reconditions it and then cots it in a bright blue rubberized plastic. Don't confuse it for a fragile art piece though. It's weather proof and can be used indoors or out. Yosuke Watanabe's Silhouette lamp is another exercise in modernist whimsy. Watanabe takes the the suggestion of a wall sconce and turns it into a focal point. One of the central tenets of modernism as an aesthetic movement is to pare down detail and to reduce an object to its unadorned, functional state. Reducing a wall sconce to nothing but its shape and its function --illumination-- is brilliant. Takeshi Ishiguro's Book of Lights throws another curve ball with the idea of modernist whimsy. 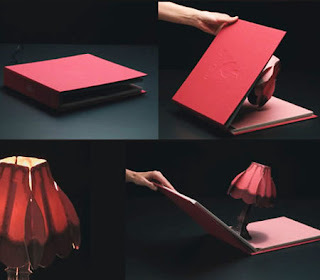 This lamp is a pop-up book that functions as a reading lamp when it's open and turned on. Talk about a brilliant idea. Ishiguro took two functions and combined them and I can say in all honestly that I've never seen anything like it. Not only that, this Book of Lights is an idea I can't imagine myself ever coming up with. Hilarious and inspired at the same time. Too cool! Jessica, the fastest way to ensure that I never go to your website is to spam my blog. If you'd like to publicize something, you can buy a display ad.